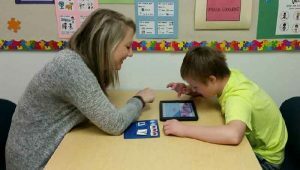 These days, assistive technology has come to the help of children with autism, both inside and outside the classroom. A big difficulty faced by children on the spectrum is that all the people may not be aware of their situation. A child with autism is likely to face problems while communicating with people in a social situation. But if a child is introduced to “What’s the Expression” and “Make Sentences” educational apps, he/she can negotiate the difficulties to a great extent. Social situations are tough for such children. Even your neighborhood grocery store or the movie hall can be filled with distractions. These distractions can trigger and continue eliciting autistic behaviors, no matter what the situation is or how much improvement the child has made in his/her communication. Educational apps, undeniably, can ease the situation. These tools help children to communicate. With the advent of the autism apps for children, societal factors are becoming less of an issue. This is because the special strengths of those having autism are beginning to be noticed. Though the autism employment scenario for autistic people is not very rosy, some big multinational companies have begun hiring people with autism, things are far from what’s actually required to get all of them gainfully employed. Experts are hoping that technology will become much more personalized in the future. The autism apps can be customized for each individual. The apps will become more intelligent to judge the intelligence of each child.